A cap (aka topper) has come up for sale on local Kijiji and it looks like it's on an older model Ranger, maybe even a 2wd. Mine's an '09, extended cab, 4x4 so has a 6' box. I'm wondering if, other than box length, there are significant enough differences between Ranger generations in box design or cab back wall angle to make it incompatible? I've asked the seller for the truck year, but have not heard back yet. It's a bit of a drive so I'm trying to figure out as much through pictures and email before driving out there. Pic attached. Fyi, I ask because it's a Leer high rise cap. Leer does not show this model available for the '09 but does for an older '97 (randomly picked year). Replace 2005 inertia switch with older model? Can you put a newer Ranger front end on a older one? Make a way to fit newer factory speakers into an older truck? 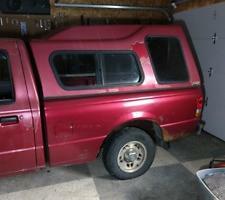 Quick Reply: Will cap (topper) from older Ranger fit newer model?